Associate Professor Thierry Beths, Head of Anaesthesia and Pain Management, who will be involved in running the clinic explained how reaching the $30,000 target will mean that the hospital will be able to offer a diverse and complete range of treatment for patients, including TENS therapy (transcutaneous electrical nerve stimulation), therapeutic ultrasound to help in the early stages of recovery from surgery and a walking mat to allow a more precise analysis of dogs and cats level of pain/lameness. 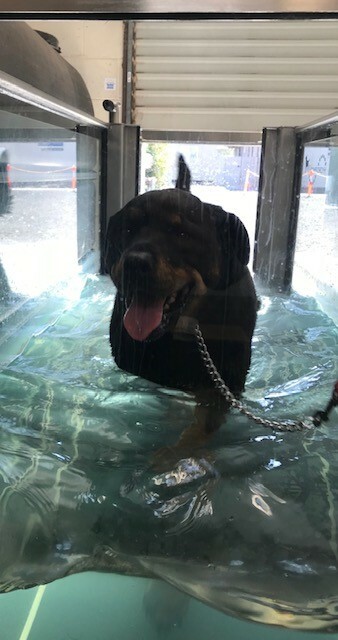 The donations so far have seen pets benefiting from our enhanced our services which now include therapeutic exercises, laser therapy, acupuncture and an underwater treadmill. These facilities help provide the best rehabilitative care for all pets, which improves their chance for a fast and successful recovery. One major outcome of these donations is that the hospital no longer has to use a make-shift pool for hydrotherapy and warm water exercises with the underwater treadmill being used almost daily to help patients recovering from orthopaedic surgeries such as knee and hip. This new equipment has additionally been used to help with osteoarthritis, weight loss and reconditioning. 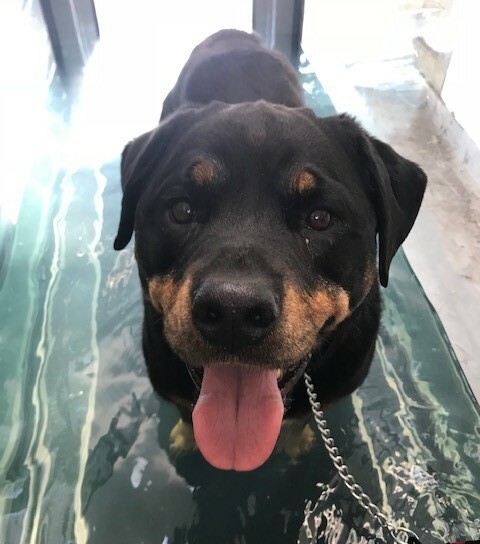 Here we see Tayla, a 9-year-old female rottweiler who had tibial-plateau-levelling osteotomy (TPLO) surgery in both hind legs. This surgery is performed on dogs to stabilise the stifle joint after rupture of the cranial cruciate ligament. Shortly after her second surgery, Tayla benefited from hydrotherapy exercise in the underwater treadmill to maintain her muscle without weight bearing or stress. Tayla has done remarkably well in her recovery and to maintain her fitness her owner Samantha has continued to bring Tayla to visit us weekly. To help U-Vet Hospital provide cutting edge rehabilitation facilities to our patients you can donate here today.